One of the highest-profile Catholic cardinals in America has been found to have abused a teen decades ago and has been removed from public ministry, the Archdiocese of New York said Wednesday. Brian Thompson reports. One of the highest-profile Catholic cardinals in America has been found to have abused a teen decades ago and has been removed from public ministry, the Archdiocese of New York said Wednesday. Cardinal Theodore McCarrick, formerly a priest in New York, a bishop in New Jersey and archbishop emeritus of Washington, "is no longer to exercise publicly his priestly ministry," Cardinal Timothy Dolan of New York said in a statement. "The review board found the allegations credible and substantiated," Dolan's statement said. The Diocese of Metuchen, New Jersey, where McCarrick, now 87, served from 1982 to 1986, said in a statement that it had no record of his abusing minors -- but that there were multiple incidents with adults. "In the past, there have been allegations that he engaged in sexual behavior with adults," Bishop James Checchio said in a statement. "This Diocese and the Archdiocese of Newark received three allegations of sexual misconduct with adults decades ago; two of these allegations resulted in settlements." McCarrick, who was elevated to the cardinalate in 2001 and served as Archbishop of Washington from that year to 2006, issued a statement accepting the Vatican's decision barring him from public ministry. 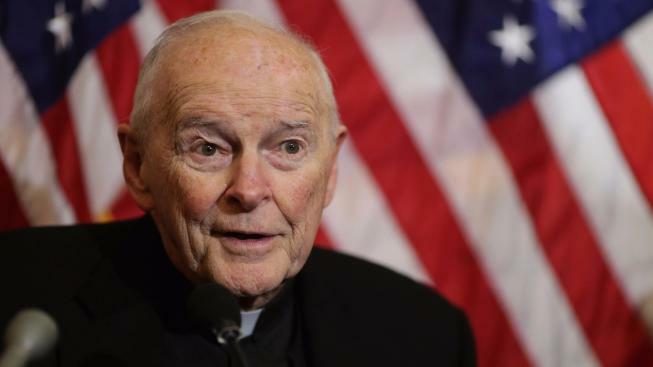 Born in New York City, McCarrick attended Fordham University and later entered St. Joseph's Seminary in Yonkers, where he earned a bachelor's degree in philosophy and a master's in history. He was ordained in 1958 and went on to study further in Washington, D.C., earning a master's in social sciences and a doctorate in sociology. Later, he became president of the Catholic University of Puerto Rico, stayed there a few years in the 1960s, and then returned to the Archdiocese of New York, where he served several roles until the early 1970s. Pope Paul VI appointed him Auxiliary Bishop of New York and Titular Bishop of Rusibisir in 1977, then went on to Metuchen, where he spent the early 1980s. Following that, he was promoted to the fourth Archbishop of Newark before he took on the role in Washington, D.C. In May 2006, he resigned that post because he had reached the usual age limit of 75. He remained religiously involved for years afterwards -- presiding over Sen. Kennedy's Arlington National Cemetery graveside service in 2009. McCarrick celebrates his 88th birthday next month.